Moses parts the Red Sea. The island of Atlantis disappears beneath the waves. The evil cities of Sodom and Gomorrah vanish in a hail of fire and brimstone. Are these just mythical “stories” or could they in fact be garbled accounts of actual events that occurred in the distant past? Geomythology is a relatively new discipline that combines geology, archaeology, mythology, and history to investigate the possibility that some myths such as these – which bear a striking resemblance to natural disasters including floods, earthquakes, volcanic eruptions, tsunamis, and meteorite impacts – could have a basis in reality. There is compelling evidence that some of these myths originated over 7,000 (and possibly up to 40,000) years ago and thus a major challenge in geomythology is seeing through the changes these stories underwent as they were passed down orally over literally hundreds of generations. 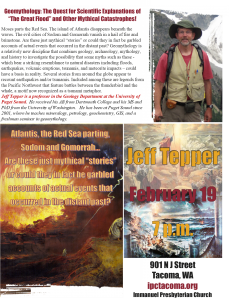 In this talk we will examine the origins of the Great Flood story, analyzing the Biblical and Mesopotamian versions as well as the recent hypothesis that the story originated with catastrophic flooding of the Black Sea around 5600 BC. We will also discuss Plato’s account of the sinking of Atlantis and several stories from around the globe that appear to recount earthquakes and/or tsunamis. Included among these are legends from the Pacific Northwest that feature battles between the thunderbird and the whale, a motif now recognized as a tsunami metaphor. 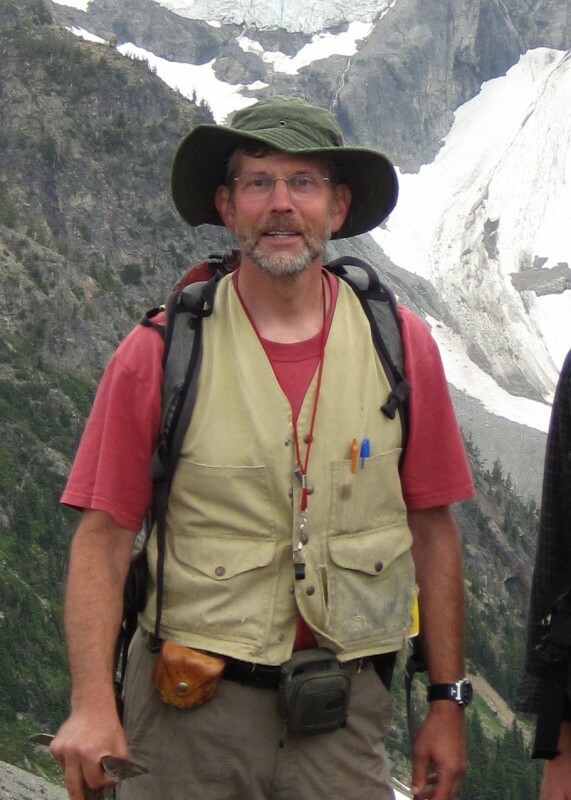 Jeff Tepper is a professor in the Geology Department at the University of Puget Sound. He received his AB from Dartmouth College and his MS and PhD from the University of Washington. He has been at Puget Sound since 2001, where he teaches mineralogy, petrology, geochemistry, GIS, and a freshman seminar in geomythology. As a researcher he uses geochemistry to investigate the magmatic history of the Pacific Northwest over the past 60 million years, and the recent environmental history of the Puget Sound area as recorded in lake sediments.